Increase production by turning your sideboards and slabs into clean square-edged boards with a Wood-Mizer board edger. Wood-Mizer's affordable single blade and twin blade edgers feature easy operation, durable construction, and carbide-tipped blades. For integration with existing wood processing systems or for the expanding sawing enterprise, Wood-Mizer's industrial board edgers and multi-rips keep your boards moving towards finished lumber, easily integrate into existing operations and have many upgrade options available. 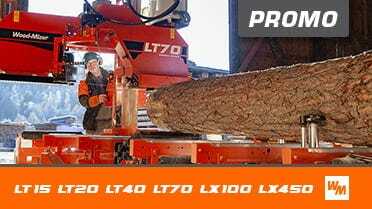 This robust machine edges material up to 40mm thick at high speeds, making it the ideal companion to the TITAN Resaws. The TITAN Automated Edger is a simple, robust and automated solution to your edging needs, using optical scanning technology to achieve high precision and low waste edging of boards. The TITAN Automated Edger uses optical scanning technology to achieve high precision and low waste edging of boards. The entire edging process is automated with each board being positioned and then scanned. The simplicity of our design, coupled with solid construction and plenty of power, produce high throughput and top quality results.